The presentation of Union Budget 2018 by Finance Minister Arun Jaitley can well fillip the penetration of general insurance in India. Here are some of the key takeaways from the Union Budget 2018 with respect to the general insurance sector. Three public sector general insurers such as The Oriental Insurance Co. Ltd, United India Insurance Co. Ltd and National Insurance Co. Ltd are all set to merge into a unified insurance entity. The integration of these three general insurance companies will create an enormous organization which is likely to take over one-third of the general insurance market. The reason behind the merging of 3 PSUs in India Currently, most in-demand segments of general insurance industry such as health, motor and industrial insurance collectively stand at a worth of a whopping 1.5-lakh-crore per year. And with each passing year, the competition between private and public insurance companies is getting increasingly severe. As a result of such intense competition from general insurance companies from the private sector, the solvency margin of two state-owned general insurers has drastically dropped. In comparison to the minimum level of 150% asset value of liabilities, the solvency ratio has come down considerably. The solvency ratio of Oriental Insurance Co. Ltd and United India Insurance Co. Ltd has reportedly been at 1.11 and 1.15, respectively which is way below than the mandatory level set by the regulatory. Solvency margin of National Insurance Co. Ltd, however, has increased to 1.90 from a below-par ratio of 1.26 in the previous fiscal year. 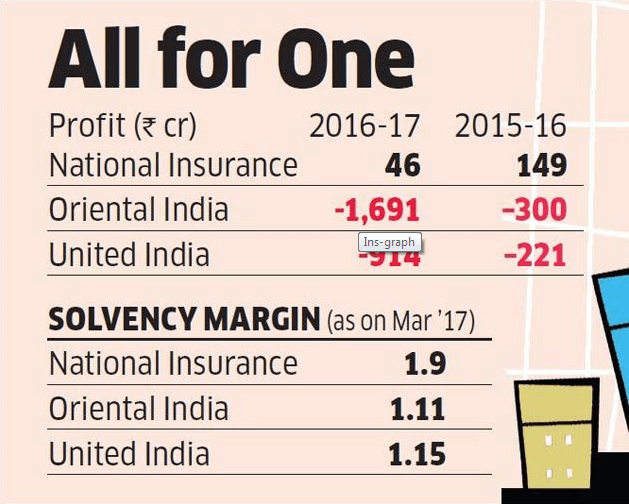 Currently, the Gross Direct Premium underwritten of three public sector insurance companies in the likes of National Insurance, Oriental Insurance and United India Insurance that are set to merge is far behind the fourth public sector general insurer New India Assurance. Let’s take a look at where these 4 public sector general insurers stand in the current fiscal in terms of Gross Direct Premium underwritten. Reduction in the outflow of cash of reinsurance premiums. A comprehensive health insurance coverage to more than 10 crore poor families is announced which will benefit over 50 crore vulnerable people in India. This ambitious scheme is designed to cover both primary and tertiary treatment. Each and every family need to pay around Rs. 1100 to avail this health insurance coverage. The coverage of R. 5 Lakhs will be available on the reimbursement basis. Impact of the launch of World’s largest healthcare scheme Health insurance business opportunities are likely to increase with rising in health insurance coverage. However, some of the previous government-funded schemes failed miserably because of wrong pricing, so, this aspect of the proposed health insurance scheme needs to be taken care of. If the pricing part remains affordable for the targeted section of the society, this revolutionary scheme can boost the penetration of health insurance in India much like the success of crop insurance in the last year in India. With the advent of this avant-garde health insurance programme, the value of stocks of general insurance companies in India have also risen as the improvement of their businesses is now highly anticipated. Some more offerings in Union Budget 2018 in insurance sector Finance Minister Arun Jaitley on Thursday announced some other initiatives under the Ayushman Bharat Programme in the Union Budget 2018. Let’s take an elaborate look at this. Pradhan Mantri Jeevan Jyoti Bima Yojana and Pradhan Mantri Suraksha Bima Yojana have also been extended in the Union budget 2018.These two schemes are aimed to bring in all poor households that belong to the marginalized sections under the coverage of health insurance in India. The first scheme is designed to protect economically weaker families in the unfortunate event of accidental injury and death. The second scheme is about the establishment of health and wellness centers with a view to bringing healthcare in the proximity of one’s residence. . There will be 1.5 lakh health centers to provide essential medicines and diagnostic services for free. A total sum of Rs. 1200 crore has been granted to materialize this giant project. The tax deduction on the payable premium of health insurance has also been increased to Rs. 50000 from Rs. 30000 in the Union Budget 2018. This highly beneficial move is not only advantageous for senior citizens but will also boost penetration of health insurance in India. Conclusion Insurance penetration in India is currently far from being impressive. According to stats of Insurance Regulatory and Development Authority of India as of 2016, the insurance penetration stands at a dismal 0.77% in general insurance sector. With the landmark Union Budget 2018, this abysmally low percentage is expected to rise.